Link to early flier for the W28. David F. - Kuria Salos - Koine Greek for "Lady of Waves" Great site with a lot of images. I feel you are overlooking a significant market: People who would like to cruise but do not have the money for a 32' boat, even as a kit, nor the time for cruises to Tahiti and beyond. It seems to me that a good, solid cruising boat of about 27' LOA without the six berths in 25' syndrome would have a great appeal for short distance offshore work. Westsail is the ideal firm to undertake such a task. Are you giving it any thought? Ed. Note: We have had a number of requests similar to yours, and wonder why one of the many small boats on the market do not meet your needs; they certainly are inexpensive enough and some are fairly well constructed. To build a Westsail of, say, 27' won't reduce prices as significantly as one would like, as so much of the rugged construction of our 32 would cost little less on a smaller boat. However, to determine just where everyone's interest lies, we will be running a questionnaire in the next Windbag on other size boats. Meanwhile, letters are invited. By fall of 1975, things had changed. That season's Windbag (V3No5) carried an article introducing the new Westsail 28, designed by Herb David. The specifications in the article were stamped “PRELIMINARY”, indicating that the boat had not yet been built. 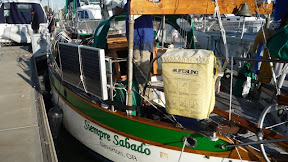 “The pride of the oceans....a hearty little offshore cruiser perfectly outfitted for 2 to 3 to cruise trouble free around the world or around your favorite anchorage. The new Westsail 28 is a Westsail in every way, yet she's really affordable without committing your whole future...just yet....to the idea of cruising. These preliminary specifications stated that “the Westsail 28 is only available as a complete boat.” The price was $27,950.00, ready to be loaded in Costa Mesa, California. This price did not include sails, winches, second battery,holding tank, pressure water, etc. However, all of these options, and others, were available fromWestsail. Those preliminary drawings look exactly like the first W28s that were ultimately built. By winter of 1975, the first W28s had been built and were scheduled to be shown at boat shows in Newport Beach, CA, San Francisco, CA, and Wrightsville Beach, NC. A brochure from that time (12/75) shows that the cost of the completed boat had climbed to $29,000.00. As the first boats were rolling out, design changes were being made. After the first half-dozen or so were built, the ballast was increased form 3500 lbs to 4200 lbs, the overall displacement went from 9,500 to 13,500 lbs. This lowered the boat in the water resulting in an increase in draft from 4'0” to 4'4”. And, of course, a larger suit of sails was required to move the increased weight. The working sail area went from 480 sf to 545 sf. The rudder was enlarged and the now-familiar “step” on the rear of the rudder was added. Somewhere along the line, perhaps after hull #20, a boomkin was added. The fall, 1976 issue of Windbag showed that Westsail had changed their position on making the W28 available as a complete boat only. Departing from the W32 design, Herb David refined the Westsail 28 from the keel up. A taller rig increased the sail area for enhanced light wind sailing. The redesigned hull produced a drier ride than the W32, with greater windward ability, maneuverability, and a more responsive helm. The result is a stout cruiser capable of a reasonable speed. 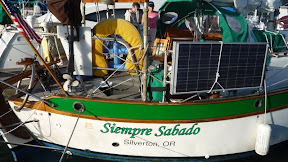 Westsail 28 hull number range from #1 to #78 the molds were last seen between Guyamas and San Carlos, Mexico. .....stout enough to handle anything, and beautiful enough to make the eyes turn of even the most hardened racer. Sail Area (working sails): 545 sq. ft.